The Epitome of Kwaai | Shouldn’t we be doing something… constructive? Shouldn’t we be doing something… constructive? Dua is the weapon of the believer. Whatever befalls a believer is best for him. All Praises are due to Allah, the Lord of the entire Universe. What more is there to say than Alhumdulillah? May Allah grant those few people who died because of the storm the status of Shaheed. Dying from a natural disaster. Alhumdulillah, green birds under Allah’s throne… eating from the fruits of Jannah… :) what can get better than that? With Ike came the birth of real life. The life that millions – no billions – of people before us had experienced. Life seemed to slow down. No TV. No Computer. No Lights. You know it’s amazing how much we rely on electricity. It’s like every single thing we do in life HALTS as soon as power is removed. It’s crazy… but it makes you think. How human are we? Are we just robots… a piece of equipment that fits into this big electrical machine? We are the consumers, the users… electricity is our lifeline. We feed off of it. And surely Allah Subhana wa ta’ala can take away everything within the blink of an eye. As a test, to see if we will pass or fail. Can one of our vital assets be taken away without us complaining and whining and moping around all day? Would we take advantage of the new opportunities that had arisen? Ike, Alhumdulillah, you were a blessing in disguise. Never have I seen a more beautiful moonlit night than the nights after you had struck. Never had the time passed by so slowly… with every minute the possibility of a new adventure. Never had I talked with my family for hours upon hours face-to-face about everything and nothing and anything all over. You brought us back to reality, back to this earth that we live in, this Universe that we glorify our Lord for 17 times each day. “Alhumdulillahi Rabil A’lameen. Praise be to Allah, Lord of the Universe.” The Universe that we had forgotten about in our technologically swamped lives. You humanized us… by taking away everything that had made us into robots. Ike, you were a blessing in disguise. I anticipate the future… I await what shall happen next. Isn’t that what we’re always doing? Waiting for something. A post I made on CY a while ago… but the thoughts strike me again. What are we waiting for? We’re all either in highschool or University right now… some may have graduated. I always used to feel like I’m in a transition period. In highschool I felt like I was waiting to graduate so I could finally go to University. Now that I’ve done a year at University I feel like I’m just waiting to graduate and do the next big thing…. what’s that next big thing? Work? It doesn’t sound too exciting. Life is what happens while you’re waiting for something to happen. Oftentimes I wonder, when will my death date be…? it’s something I’m not looking forward to.. although in a way I am. InshaAllah we go to Jannah. I feel scared about what I want to do.. and whether or not I will go through with it. Whether or not it is good for me. Whether or not it will be successful. Whether or not my life will be taken.. just waiting for the right time to go through with it. I don’t even know whether I even should do it. I wonder. I want to, but can I? Will I? Do I have what it takes? As I started off this summer, I was really hoping I wouldn’t just waste it.. kinda like last summer.. you know just hanging out with friends, doing useless nonsense, etc. And Alhumdullillah, just by making that intention, so much has started differently with this summer. First off, I landed an internship with an amazing ophthalmologist, I’m waiting for my research stuff from M.D. Anderson (don’t know if i actually have time for that), I think i’ll be tutoring again this summer for math/science/english… but the coolest of all.. I found a NEW HOBBY. You won’t even understand. Whenever I’d do somethng my mom would be like, “Whatever you do, just remember Allah when you do it.” And SubhanAllah this hobby completely encompasses the rememberance of Allah. I don’t know what sort of rant I’m going on at the moment. But my new hobby is.. CALLIGRAPHY. I bought canvases. Loads and loads of canvases.. and paints.. and like 500 types of paintbrushes transfer papaer and carbon paper.. man the list goes on and on.. So anyway.. after fajr, when i come back from my morning run, I just sit peacefully painting different backgrounds and then writing the different names of Allah. I’ve made six so far. I’ll post them up here when I get the chance. I’ve made those six for six of my closest friends. Becuase of that I started researching the history and background of Arabic calligraphy.. which led me to calligraphy with a Persian influence.. and WOW.. it’s all just so amazing. Like this holds so much history within it.. it’s a bit mind-boggling. Anyways, Alhumdullilah my time to waste this summer has, fortunately, been decreasing. I actually went and bought an MCAT book. Call me crazy.. but I might as well take a whack at itthe practices, right? I still have two years until I can officially freak out and hyperventilate. So i’ll just stare at the book and chill until then. Anyways, today Guildenstern and I have decided we will go roller blading. We actually decided this many weeks ago, but let me tell you, the search for roller blades was interminable. We couldn’t find any decent ones. So I settled on buying mens’… the women ones were too — feminine. Anyways, I hear my mother yelling my name to take my sister to the park.. so I must end this long litany of nothing. I have no clue what I just posted.. but I hope now that I have some time, I don’t go back to my days of wasting time on blogs/facebook/ CY. Somewhat beneficial.. but not worth the amount of time I devote to them. Hope you find success and time well-spent in this day InshAllah. Ojala que ustedes no pierdan el tiempo..
Alhumdulillah. All praise are due to Allah. It is only his promises that keep me going… you do your part, and He will surely do His. Sometimes in life you want something soooo bad, and you wonder… why won’t it come to me? Why can’t Allah just grant me this one thing? I’ve tried to be a good servant, I’ve tried.. and messed up a hundred times.. May Allah forgive me. But it may happen that you hate a thing which is good for you, and may happen that you love a thing which is bad for you. Allah knows, and you know not. We can plan all we want, we can set ourselves up… but nothing happens without the will of Allah. Allah knows what we know not. They plotted and planned, and Allah planned too; Allah is The Best of Planners. I have trust in you Allah, I have trust in you. I will not forsake you, and I know you will not forsake me. If I don’t get this in this Dunya, then inshaAllah I will get it in the Hereafter. Allah will grant a way out for anyone who heeds Him, and provide for him in a manner he could have never anticipated.Allah is enough for anyone who relies on Him; Allah will accomplish His purpose. Allah has granted everything in due proportion. Seek help in patience and As-Salat (the prayer). Truly, Allah is with As-Sabirun (the patient). And if I don’t get it.. well.. life goes on. May Allah Subhana wa ta’ala allow me to return to you forever and ever again. Ameen. and being overwhelmed with it’s safety..
You can’t understand how true that statement is until you feel it for yourself. SubhanAllah… your heart always feels content there, and when you are far from it, your heart aches. Alhumdulillahi Rabbil Al Ameen. May Allah Subhana wa ta’ala grant us all the opportunity to visit these amazing cities whereupon the greatest man of all time walked. How could she retain all this knowledge? HOW does she know all of this, and HOW are we soo uninformed? Are we stupid? MashAllah, Fatima is someone I really look up to. She’s a genius. She can speak eloquently, she’s extremely fun to be around, and she’s always helping in the community.. she’s just an all around Awesome girl. When Fatima left for class, Khadija and I sat there for a good 10 minutes feeling like someone had just smacked us with the Stupid Stick. We knew nothing of what she was talking about, we felt so uninformed, un-updated, as if we were living in our own little bubble… we felt like… useless humans. As I was walking down the stairs of the RB to get to my next class.. I had my head down, thinking about everything I knew, everything I had done, everything I had accomplished… and I came up with a pathetic amount of answers. Why was I of any use? Why don’t I keep up with the world? Why don’t I ever care about my classes that much? Why do I feel content with my certain situation, when I’m not even advancing as a productive citizen of this nation? Why am I such a sucky… human? As I opened the door to exit the RB, a frown across my face… I looked down and saw a pebble, then suddenly I looked up to see the beautiful trees swaying… then the sky… the magnificent sky. It was my Rabb that created this all, my Creator. I was his servant, and that was my role… to worship Him. SubhanAllah, upon that exact thought, the biggest grin shot across my face. =) I had only thought about my Lord for merely one second, and my heart felt eons better. Sure, maybe I wasn’t the best news-watcher, student, or human… but I know that there is a bigger purpose, and as long as I strive for that, I can smile all day long. There is indeed hope, at the end of this long, drawn out tunnel. Of course, I’ll mess up along the way, I’ll sin and sin, but I know.. 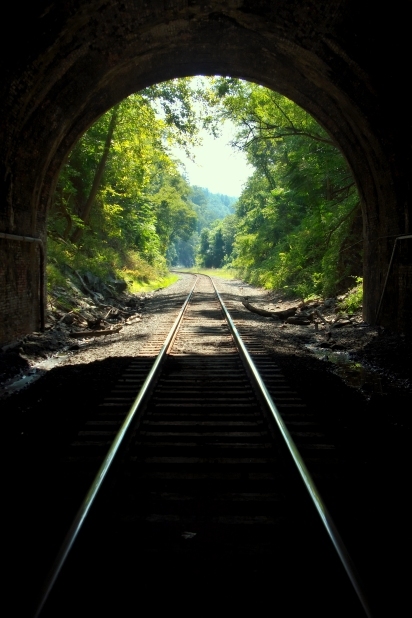 He is waiting for me at the end of the tunnel, his hands out, ready to forgive my every fault. And then the Ayah hit me… and everything seemed to make sense. I found my peace, in the rememberance of You, Ya Allah. Grant me the opportunity to continue to remember you, and to continue to find peace. Ameen.